If you live in Brighton and have ever tried to have any kind of online gaming session, you have more than likely had issues. Lagging all over the place, other devices in the house being frozen out or forced to slow down, and never mind trying all of this over WiFi. That’s where the Netduma R1 Router steps in and fixes many, many issues relating to gaming, and in general, WiFi network issues. Firstly, a few basics. What is a router? Well, if you’re on Virgin (and let’s be honest, as a student you more than likely are), it’s the little black box they (or another provider) installed to get you online. It, in simple terms, allows the cables running from the street to your house to provide an internet connection, whether it be over WiFi or plugged in over Ethernet. These days, WiFi is becoming a bit of a pain, to say the least. The popular 2.4ghz radio frequency channel is used by all sorts of devices – from microwaves to wireless door bells – and any of these devices can interfere with your WiFi connection. In my house, the router is not in the living room, and so it is an absolute pain to have fluctuating speeds and wireless drop-outs. My house picks up 24 WiFi connections – so, is this an issue, and if so, how do you fix it? The recent answer is using different WiFi channels on your router, a setting you can change if you log in to the router. If you don’t know how to do this, there’s no need to worry as there is a good chance your router is doing this already for you. Channels 1, 6, and 11 are the best, and if spread out, provide fewer chances of dropouts. There is also the option of using a different radio frequency – 5ghz. Generally, this doesn’t have as much of range on it but has far less interference. Okay, still with me? Now let’s talk about the Netduma R1. Geo-Filter – The number one cause for lag in games is down to distance. This nifty feature allows you to set a preferred max distance and ping (the lower the ping to the server/person you’re playing with, the better). This will easily increase your chances of getting that first kill or goal tenfold. Device Prioritisation – This allows you to look at all the WiFi devices in your house, and set a percentage of the internet a device will receive, IF (and only if) your internet speed is maxed out. This is absolutely brilliant for gamers – or just houses with people using Netflix and the like constantly – as you will never receive lag again. Anti Flood – This feature is very clever. The router has the option to limit your max internet speed, say to 80%, at all times so if your internet has a sudden surge in use, you do not suffer. 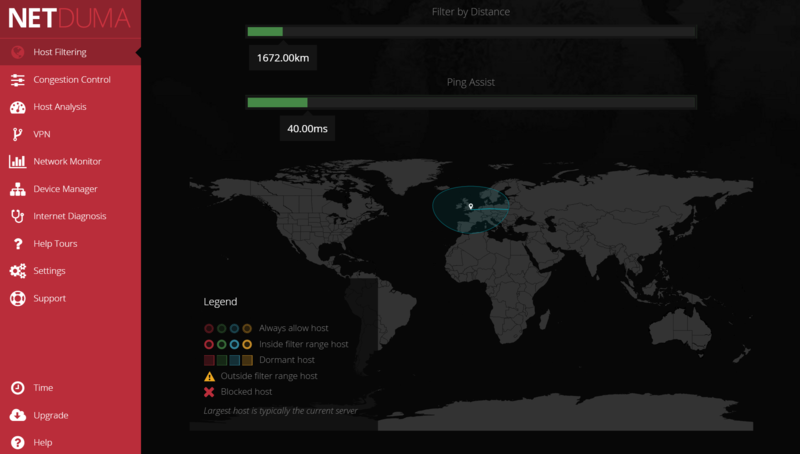 This allows the router time to look at the prioritisation settings and distribute the connection evenly. And there’s more: one-click VPN, for those of you that want to keep your privacy intact; you can allow and block hosts, so that you never connect to the gamer who uses coal to power there console or PC of choice and a Network Monitor, which means you’ll never argue about who is using up the internet ever again. They have more features coming all the time, particularly in the new year – features that will eliminate spikes in internet connectivity and speed far more effectively that a router twice it’s price, which you can read about on the Netduma blog here. This is what my Geo-Filter settings look like. As you can see, the interface really is quite neat and pretty compared to anything I’ve seen before. The important question is, does this all work? Whilst it all sounds great, it needs to work for the £149.99 asking price (£119.99 in the Black Friday sales). Yes, I am pleased to say, it does work. I have chosen not to do any specific tests to do this, but a few simple ones. With the Geo-Filter set to a reasonable distance (most of Western Europe) and the ping set to 45ms, I had virtually no issues. Switching between having this on and off clearly made a difference on console games such as Black Ops 3, Battlefront and Fifa, or something a bit cheaper like Rocket League or DOTA 2 on the PC. Other devices never experienced issues, and we didn’t have to ask someone to stop gaming because it was taking up all the internet. The Netduma R1 router calmly shared the internet fairly, even when we were using Netflix and with two consoles on the go. The bottom line is, this router simply works at what it promises to do, and more. By eliminating technical issues you really only have yourself to blame now – sorry, but blaming it on the internet anymore just is not acceptable if you have a Netduma R1. If you haven’t, what are you waiting for? P.S. They are currently running a competition until Christmas Eve to win a Netduma R1 gaming router, and a console and game of your choice. Details can be found on their Twitter.